Darkest Dungeon launches on PS4 and PS Vita September 27 with cross buy and cross save features for all. We’re extremely excited to share the game with the PlayStation community, and have snuck in a few bonuses to help make the console version of Darkest Dungeon something special. 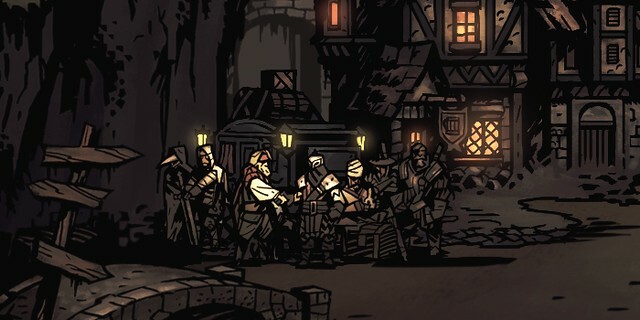 Objects of power are vital to player success, and in Darkest Dungeon we call them trinkets. Trinkets come in many forms — from conventional stones, herbs, necklaces, and bracers on up to holy scrolls, nefarious potions, bunches of garlic, and occult symbols teaming with ethereal energies. Their potencies vary, but as a rule they mean to empower your characters. Like everything in Darkest Dungeon, however, each comes with a cost. While a trinket may increase the damaging potency against protean evils, it may also increase the susceptibility to maladies that wait in the cold darkness. For all our PlayStation players we now start fresh estates with two trinkets: a Stone of Patience and a Stone of Endurance, as a small way of thanking our fans for their gratitude and support and patience as we developed the game. We’ve taken some time to embellish each of the four main dungeons — a new background has been added to the Ruins, Weald, Warrens, and Cove, adding more variety and character to each location. We’ve also added a new Town Event: “A Day Long Awaited.” In celebration of the PlayStation launch, this event gives players a Stagecoach bursting with bonus recruits — word has spread of the riches to be found in the dungeons beneath the Estate! Been waiting desperately for that Jester? This event can help it happen. To celebrate the launch, we’re offering North American PlayStation Plus members a 20% discount for two weeks , for both PS4 and PS Vita! European PlayStation Plus members can pre-order and also receive the 20% discount. The Town Events, Trinkets, and new dungeon backgrounds are a limited exclusives. We will be adding them to the PC versions of the game at a later date. Controller support will also find its way back but it won’t be until sometime after the PlayStation release window, to ensure that our new players have a smooth gaming experience. We’re looking forward to hearing the tales of triumph and defeat from our new players! We have a wonderful community of players on our subreddit, and our website. Also, please feel free to reach out to us on social media with any and all comments.